Manage Irrigation & monitor your farm. Smart meters, AMI, Demand management, Sewer overflows. Connect your meters and sensors to the cloud with the world's easiest remote IoT monitoring solution. We have world leading remote IoT monitoring solutions for connecting meters and sensors to the cloud. But don't just take our word for it. Winners of the General Electric Ecomagination Challenge, The US Irrigation Association New Product contest, NZ Hitech awards, NZ Innovators awards, University of Auckland Entrepreneurs' Challenge and the Deloitte Asia Pacific Fast500 for fast growing revenue. Three times! 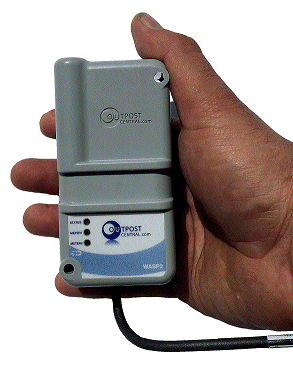 Outpost has been in business since 2002 and has delivered tens of thousands of monitoring solutions. We're here to support you for the long haul. Our compact and robust hardware devices are very simple to install and connect to most industry standard meters and sensors so you can collect information from remote places. The devices are waterproof and either have long life internal batteries or rechargeable via a solar panel. Our devices can connect to global cellular networks like 3G and GPRS or even satellites when you are out of coverage. Collect information from your meters & sensors no matter where they are in the world. From cities to remote farms and mines. Display your data in powerful online graphs, reports or interface your data with your own systems using our API. Outpost Central web solutions process information from tens of thousands of remote devices and display information in a format that helps you extract value from your IOT solution.